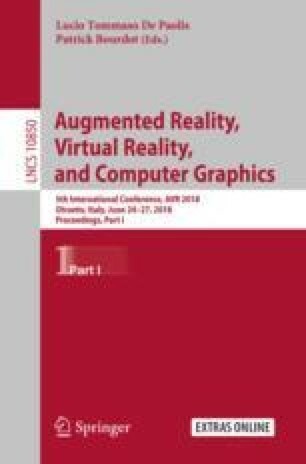 In the fields of Augmented Reality (AR) and Virtual Reality (VR), Human-Computer Interaction (HCI) is an important component that allows the user to interact with its virtual environment. Though different approaches are adopted to meet the requirements of individual applications, the development of efficient, non-obtrusive and fast HCI interfaces is still a challenge. In this paper, we propose a new AR and VR interaction interface based on Human Action Recognition (HAR) with a new binary motion descriptor that can efficiently describe and recognize different actions in videos. The descriptor is computed by comparing the changes in the texture of a patch centered on a detected keypoint to each of a set of patches compactly surrounding the central patch. Experimental results on the Weizmann and KTH datasets show the advantage of our method over the current-state-of-the-art spatio-temporal descriptor in term of a good tradeoff among accuracy, speed, and memory consumption. This work is supported by the CAS-TWAS Presidents Fellowship, the National Natural Science Foundation of China (Grant No. 61371192), the Key Laboratory Foundation of the Chinese Academy of Sciences (CXJJ-17S044), and the Fundamental Research Funds for the Central Universities (WK2100330002, WK3480000005).